Here is the ad for the program I'm developing and links to the FB page! Researchers from the University of Windsor have developed a free program designed to give you feedback on your gambling and help you decide whether you might want to make changes. Gauge your Gambling is a website application that can help you to better understand your gambling and consider possible change plans. NEVER, NEVER, EVER PLAY NO LIMIT POKER--It is a quick, sure way to the poor house. No limit poker= no limit to your losses The risk/reward ratio is not in your favour. No limit poker is also known as the yo-yo game, roller coaster game, and bipolar game. The swings are so dramatic in each session that anyone playing it for a prolonged period might end up with a mental illness, such as bipolar. I lost another $300 today at no limit poker. I won my losses back from a few weeks ago, then dropped $300. I'm now officially down $300 from poker in two years. It's a vicious up and down cycle that has to stop. Today was a living hell. Spouse was still sick with standard cold/flu symptoms. Massive downswing... not sure how much... don't really care how much. He should not have been playing. He said a lot of things and I said a lot of things but I do not remember what they were. Deep depression after the post work fight. Suicidal thoughts were getting out of hand so I called a crisis line and stayed on the phone until my medication kicked in. I'm calm, at ease and so productive when I let go of gambling. It is one less thing to worry about. 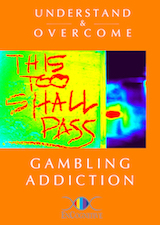 Gambling creates a tremendous amount of tension and anxiety because it's something we cannot control. When you want something for nothing (gambling), you need up with nothing. You gotta work hard for everything you want. Those who take short cuts end up at the starting line. It's a vicious circle.